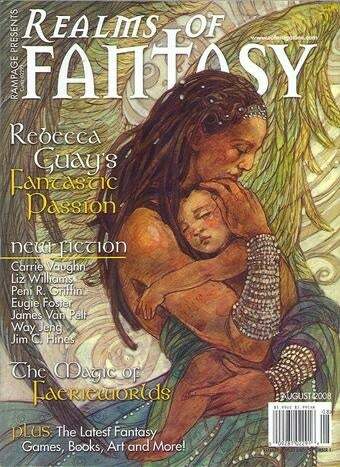 The always awesome Realms Of Fantasy magazine almost went under a year ago, but under a new publisher, the magazine's newstand sales and advertising are up. But Realms still might go under, unless more of us renew our subscriptions. Since Warren [Lapine] bought the magazine, newsstand sales have been up and advertising is definitely trending in the right direction. That's the good news. The not-so-bright news is what I just mentioned, i.e. the subscription renewals aren't coming in at a high enough clip. Because of that, there is indeed a danger to the magazine's future. When Sovereign abruptly closed RoF back in 2009, it came as something of a shock to the community. So instead of risking subjecting everyone to that exact same scenario once again, Warren has chosen to make the community aware of the situation. When the magazine was initially cancelled, there was a tremendous outcry, so this time around the magazine's new publisher is giving the speculative community the opportunity to have a say in the magazine's future. If RoF isn't meant to continue, it won't be because the community as a whole didn't have a chance to get involved. Since Warren took over we've delivered a year's worth of issues. In that time, he has been terrific to work for. He's improved the magazine's cover stock and he's given us a terrific website to complement the magazine. We've added a column to the magazine without sacrificing any existing ones. Warren has also made the magazine available for purchase through the Kindle and we're currently exploring other avenues to make RoF available to an even wider audience. Transitioning under a new publisher is a long process. There is no denying there have been some road bumps along the way, but we'd like to think that with each issue the revived RoF has been steadily improving. We have a lot more in the works to continue building on what we've started, and we're confident that if our readers stay with us, their patience will be rewarded. So if you'd like to see RoF continue, the easiest thing you can do is make as many people as possible aware about where things stand with the magazine. But the most important thing you can do is subscribe or renew your subscription at your earliest convenience. Writing a note like this is never easy. No one likes asking for help. But as much as RoF means to everyone on the staff, we also understand that this magazine is bigger than any of us. It belongs to the speculative community, and it has for almost sixteen years. It's a community filled with tremendously intelligent and creative people. Not everyone in it will always see eye to eye, but when it comes to speculative literature, everyone will agree that we want what's best for the community as a whole. But it's not for the magazine's publisher, editors, or columnists to state that RoF continuing is best for the community. It's for you to decide, the readers, writers, and artists. The other editors and other publishers and other nonfiction columnists. In short, the community should decide what is best. And that's why we've chosen to make you aware of the magazine's situation. And if you should choose to support the magazine, please know it will be most appreciated and we'll all do our best to reward your faith in and support of us.